.... from our family, to yours. What's everyone else wearing today? 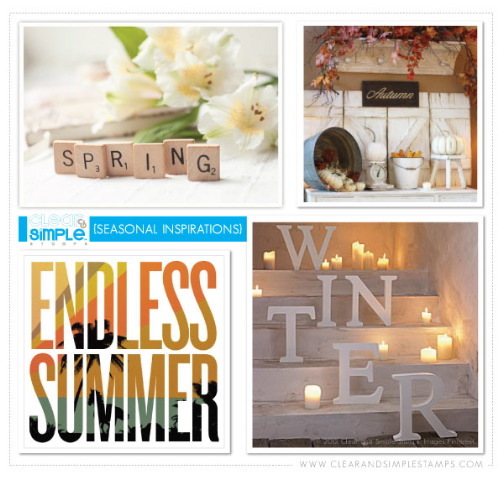 Seasonal inspiration: let me wine & dine you! A bottle of red wine, a gift card to your favorite restaurant, and a cozy card filled with all the "sweet nothings" you don't always say out loud... hee. I love a cozy plaid for winter - don't you? I used the new-to-me "create-a-plaid" to create my background. I inked up a warm red, and two tones of grey ink to create the look. I then die-cut a tags #1 shape, and stamped it with the coordinating frame. I also stamped the cookie-tree, and a sentiment (from "cookie bake"). Everything on the tag was white-heat-embossed. 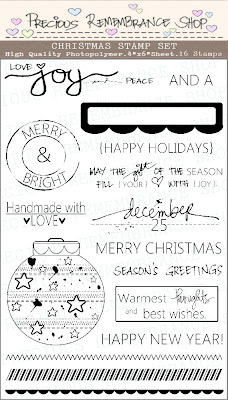 The same steps were taken to create the bottle tag, except that I stamped the snowflake cookie in grey ink instead of the tree. Here's another card that we created at my most recent Christmas card class. It was inspired by *this card* of Yainea's. She's brilliant, and if you've never stopped by her blog, please take a peek. The cute things she does with lawn fawn stamps are incredible! I actually have to admit to liking her card better than mine, but it was fun to turn her fall card into a Christmas-themed one. Click on the image to be taken to the app store, and download it to see more of my Thanksgiving spread! Here's the whole lot - Do you see the cake-stand on the right with the piles of banners? Because, how are you supposed to photograph 10 banners? hee. I took cues from the invitation to create this fun food-table banner. Each panel was way too large for me to use any existing stripe stamps, so it was me, a black copic, and a ruler to get 'er done. worked perfectly. These guys are getting slapped on little treat boxes... some of them ended up with black teeth, which is cracking me up. Ahhhh ,the beauty of handmade! This is one of the 10 banners that were folded up in a pile in that first photo. They will each hang over their own carnival game booth. I hope you enjoyed your walk-through the decorations! I'm looking forward to seeing some photos of the party after this weekend (*squints eyes at Lisa*) It's gonna be huge! Are you surprised to see me here? yeah, me too... it's been so long! I went the non-coloring route with the house from "boards and beams." I stamped it in a dark grey ink onto a piece of white cardstock, and then stamped the snow flurry (from lawn fawn's "let it snow") over-top in a watermark ink. After sprinkling it with white embossing powder, and heat setting it, I rubbed a blue distress ink over the area, making it look like a little snow-globe-in-a-polaroid. The sentiment, from "home for the holidays," was stamped in grey onto the polaroid frame. 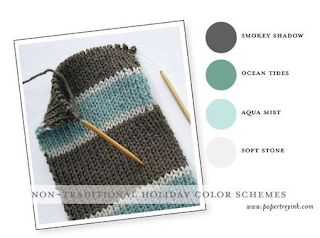 I added a little fishtail of silver glimmer paper for holiday sparkle, and some yarn for winter coziness. I hope you like it! Happy hopping! With Halloween right around the corner, the CSS design team is offering up our best ideas for making the holiday "no trick" and "all treat." For my first offering, I've taken snack-sized sandwich bags and filled them with yucky-looking popcorn - perfect for the year's spookiest night. I made a kettle-corn topping for the popcorn, but dyed it green in some spots before baking the whole thing in the oven. The kids refused to try it at first, I had to tell them to close their eyes and take a bite - hee. Its sugary sweetness won them over in the end! Each baggie has a topper, featuring a dressed-up critter who's yelling: "a zombie sneezed on my popcorn!" Ew. But for Halloween - so awesome. I used the new comic book background, in orange, but masked out a spot to stamp the critter-in-costume (using the new "little critter dress up" set.) Some spooky black shading completed this first treat option. For my second treat option.... brown paper bags! I love these! I die-cut the "build-a-critter" owl shape twice for each treat...er.... pouch. 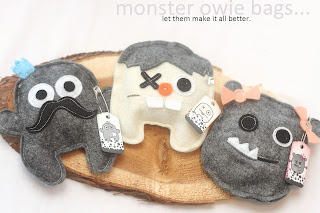 Then, mustaches, fangs, and mummy wraps for all! I die-cut all of the fashion accessories (from the new "build a critter dress up dies") and glued them on, along with a set of large, beady, googly eyes. I sewed around the edge of the treat....er.... pouch, and, before sewing it up completely, stuffed it with treats. Yup, ripped right into my mummy (thank God I spelled that mummy and not mommy...) and found some yummy tootsie rolls and halloween lollipops. In keeping with the day's Christmas theme, it is my pleasure to show off another sentiment from the new Precious Remembrance Christmas set. Christmas gets c-o-l-d over here... and lasts for months... and months... but winter is still my favorite. Why on earth? (that's what you're thinking, right?) Because it's full of lit fireplaces, and cozy sweaters, hot chocolates, and Christmas. That's why. And nothing says cozy and warm like layers and knit patterns. I love this sentiment - the mix of fonts and handwritten appeal work so well here. My favorite part is the little heart on the "J". It doesn't get any cozier than that. I'm going to be doing that thing where I start posting lots of Christmas cards... something came over me this past week... 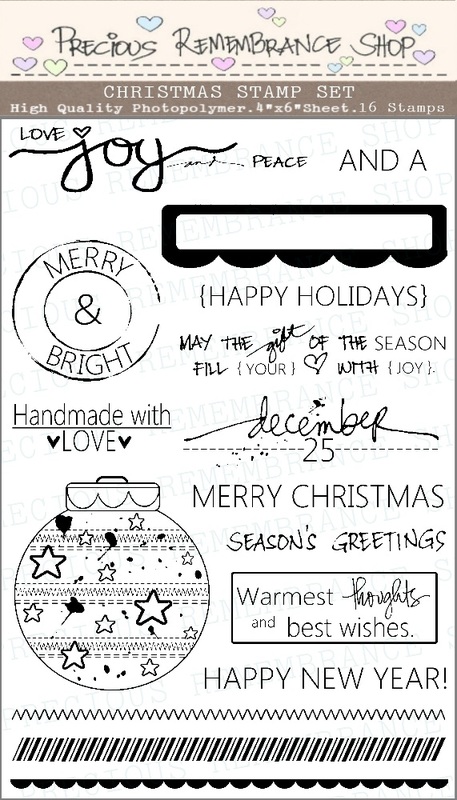 I was preparing for my first Christmas card class of the season! If you're interested in seeing my class flyer, here's a link to it on my "Just ME" facebook page: class flyer. I inked up my new Wplus9 set "iconic christmas," for this card. Instead of stamping the tree into the negative space, I sprayed in some shine mist. It's a superhero card on the CSS app today! So, that was that! What did you think of the new CSS release items? a set of mini-foxy cards! When you hit the CSS blog, be sure to leave some birthday love for our wonderful leader, Nicki. Happy birthday to a very encouraging, hilarious, and hard-working lady - cheers! The new lawnscaping assignment challenged all of us on the design team! And now we're asking you to try out a new-to-you technique. I found a tutorial on Splitcoast Stampers for creating a copic-ink-refill background and decided I liked the watery effect that it gave enough to break out my "critters in the sea" set. The technique is simple: on a sheet of glossy photo-paper, I squirted a few drops of copic re-inkers. I opted for 2 different blues, and a light beige (which I only dropped in a few places, to simulated the light hitting the water.) As soon as the ink hit the glossy paper, it begins to spread. I continued to add drops until I was satisfied with the coverage. Then, the fun part: using hand sanitizer to keep the ink away from certain spots. I filled a shallow cup with some hand-sanituzer, and used a toilet paper roll and a napkin to push the ink away. I wanted my ink to bleed quite a bit and not show any obvious rings, so I dabbed the napkin over the entire area in the end. Once dry, I hand-cut the waves and sponged around the watery edges with a darker blue ink. I added some critters, and a fun speech bubble to round out the card. Hope you join us this week - I can't wait to see what other techniques pop up in our gallery! 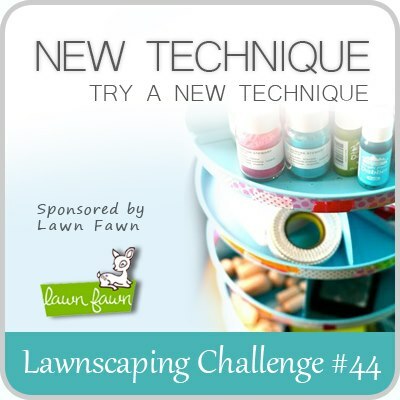 The challenge is being sponsored by lawn fawn - so try your hand for a chance to win! lawnscaping blog hop: fall edition!